If you are a fan of chocolate mousse (and seriously, who isn't?) 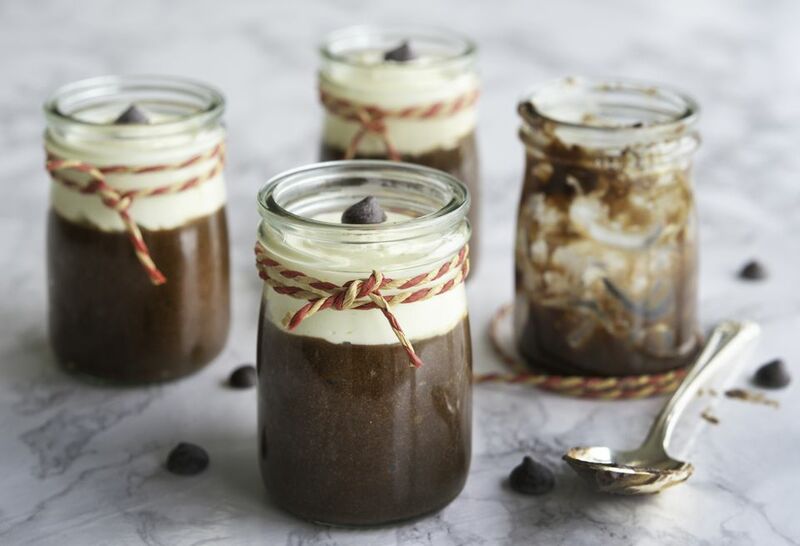 you're going to love this quick and easy peanut butter chocolate mousse. With the addition of a little flaky salt at the end, it gets even better. A sure-fire winner for chocolate-lovers. Start by melting the chocolate. Either place the chocolate chips or gratings into a heatproof bowl set over a pan of simmering water. Do not let the bottom of the bowl touch the water, and resist the temptation to stir the chocolate until it has melted. Once melted, you can stir with a wooden spoon, not metal. Or, melt the chocolate in a microwave for 30 seconds, stir (with a wooden spoon) repeating for 30 seconds at a time until smooth. Remove the bowl from the pan or the microwave. Stir in the peanut butter and set the bowl aside to cool for 5 minutes. Lightly beat the egg yolks with a fork, then stir into the chocolate to create a glossy, thick sauce. Add the 1/4 teaspoon of salt and stir again. Whisk the egg whites using a stand or electric mixer, or by hand with a whisk. Ensuring the whisks and bowls you are using are scrupulously clean, because if not, they will not whip up very well. The egg whites are ready when they are firm and glossy. Put the wooden spoons aside, use a metal tablespoon and stir in 1/3 of the egg whites to loosen up the chocolate. Then, again using the metal spoon, gently fold in the remaining egg whites. Gently spoon the mousse into either one large bowl, or divide into four jars, glasses, or bowls. Pop these into the refrigerator for a minimum of one hour. You can also make the mousse the day before needed. Cover tightly and chill until ready to serve. When ready to serve, loosely whip the cream to soft peaks and spoon onto the mousse. Decorate with more chocolate, salt flakes, or even fresh raspberries. The mousse does not store well and cannot be frozen, so enjoy fresh. Not everyone likes dark chocolate! If you're serving the mousse to children, you may want to switch it out for milk chocolate and leave out the salt — it will taste just as good. White chocolate is also a fabulous alternative, and works just as well with peanut butter. When melting chocolate in the microwave or over simmering water, never use a metal spoon. Chocolate becomes fragile as it melts, and does not respond well to cold temperatures. A metal spoon can sometimes be too cold, and will shock the chocolate, which will "seize," go grainy and lumpy, and have to be thrown away.